Big bikes. Small bikes. Extra-tall bikes! Old bikes. New bikes. Built-for-two bikes! 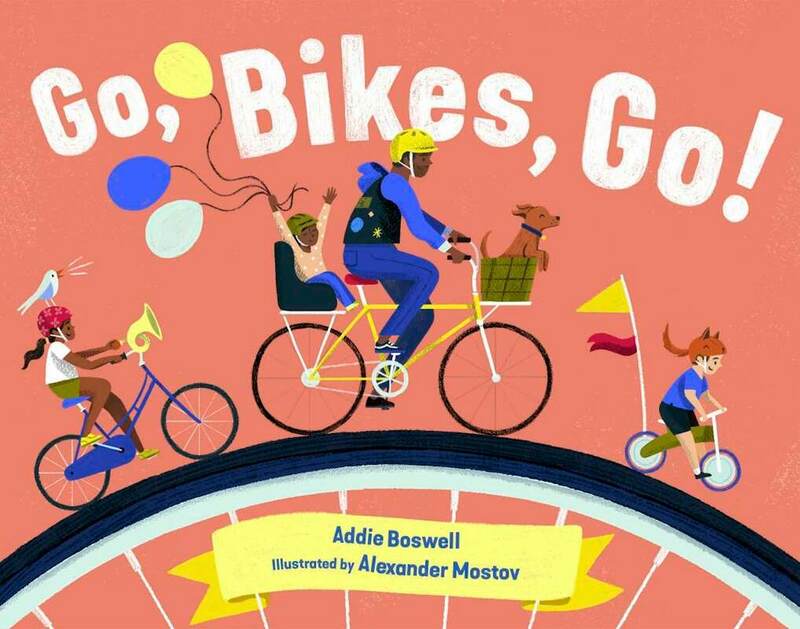 Small, sturdy, and just plain fun, this colorful board book introduces children to the joy of bikes in many forms. Is there a proper way to buy a book these days? Nope. Just a myriad of choices. Read this if you want to know how they affect authors. When I moved across the country -- from Washington, DC to Portland, OR -- my one and only aim was to "be an artist." On that fated journey West, I made an ill-fated decision to buy a new car -- a silver Honda Civic whose interior I can still almost smell. A year later, I was on my way as an artist but couldn't pay my debts and my cute little car got... repossessed. (A relief, by that point.) A friend gave me a bike. I grew up on a farm, on a gravel road that was was miles from any pavement. I'm sure I had a bicycle at some point in my childhood, but I certainly never mastered it. So I remember my first ride at age twenty-five, guided by my friend Beth through Portland's streets. I remember her saying, "Don't weave in and out of cars, stay straight and in the view of drivers." I remember wavering on the corners, sweating profusely, and generally hating it. I don't remember how long it took to really enjoy biking. But I spent the next three years commuting by bicycle and those rides are some of my great moments in Portland. Once I found a free drawing table that I balanced all the way home. Once I felt like I was riding straight into the moon. Many times I felt connected to my fellow riders, strong in my own skin, and just happy to be alive. I saw cyclists of so many shapes and sizes, carrying such interesting things, on bikes they had often custom-made and decorated. That is the larger inspiration for Go, Bikes, Go. Then, a few years ago, I asked my students to analyze the books they remembered from their childhoods. Go, Dogs, Go! was my example. I hadn't read the book for more than twenty years, but I could still remember the cadence and the illustrations clearly-- especially the big dog party at the end. So I took the rhythm that P.D. Eastman and Dr. Seuss and the Berenstains had used to well and applied it to my bicycles. These days, I share a car with my husband and turn out to be naturally lazy. I bike less than I should and gripe about how busy Portland has gotten. But sometimes still, I feel the magic.